100’s more sales or leads from your website per month – all without having to spend more money on driving new traffic. Significantly higher-conversion rate for your website, converting a bigger percentage of your existing visitors into leads or sales. Visitors raving about your website, returning in droves and recommending it to their friends. Competitors wondering how your site converts so highly, taking many of their customers. Ultimately, much greater online revenue for your business! Learning CRO is essential to maximize your website sales & profits! Not doing it? You’re wasting money driving traffic to a poorly engaging and converting website. Discover exactly what you need to improve on key pages like your homepage and checkout flows to reduce bounce rates and increase sales. I’ll show you secrets that high-converting websites do to increase their sales & leads, like Amazon.com, Moz.com, REI.com and Copyblogger.com. Learn great techniques to highly influence your visitors into sales, like social proof & urgency. Delivered in 31 video lessons complete with walk throughs of many best practice websites. It has been taken by over 750 students and is one of the highest rated CRO courses on Udemy. “I’m already halfway through the course (I can’t stop) and I’ve quickly learned about 20 new things already! Really looking forward to implementing this stuff on my website (especially the A/B Testing tools and ideas)”. Who is this new video course ideal for? It’s perfect for those looking to do more with their current website traffic and drive more sales or leads – no matter what type of website they have (e.g. an ecommerce, blog or services website). It’s great for small business owners, web designers, online marketers, web analysts and webmasters – for beginners and experts looking for some in-depth tactics and ideas. What makes Rich Page an expert to deliver this course? I’ve helped improve conversions and sales for many 100’s of websites over the last 10 years, including Disney.com, Vodafone.com, ecommerce stores, blogs, and startup websites. I’m the proud author of two books on conversion rate optimization – ‘Website Optimization: An Hour a Day’ and ‘Landing Page Optimization’ 2nd Edition with Tim Ash. Lifetime access to over 6 hours of video content – watch anytime, anywhere (via Udemy.com). 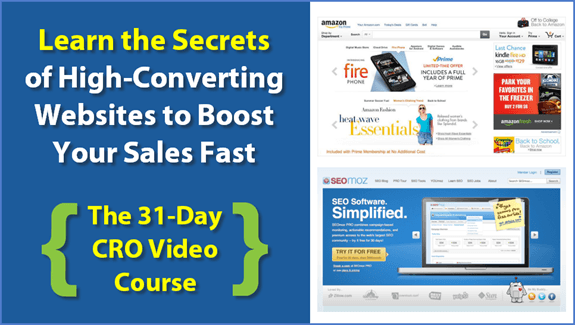 31 step-by-step lectures to follow and boost your website sales or leads. Bonus guides to ensure better results, like a unique value proposition checklist and use case tracker. Discounts: Save $100 on Visual Website Optimizer A/B test tool and a conversion review from Rich. And there is no risk to you when purchasing it. I’m so sure this course will work for you, if after taking the course you don’t increase sales or leads within 30 days (unlikely to happen), I will give you a full refund. Simple as that!